RASCI model is a business analysis tool that is used to identify roles and responsibilities in a business process. It is a great way of resolving any procedural conflicts and increasing transparency of processes and roles in a company. Analysis & division of workload: activities can be distributed effectively between teams and team members to ensure every resource is utilized and not overworked. Responsible: person who performs an activity or does the work. Accountable: person who is ultimately accountable and has Yes/No/Veto power. Consulted: person that needs to feedback and contribute to the activity. Informed: person that needs to know of the decision or action. How to identify RASCI roles in a process? You can specify RASCI roles for any resource from the right panel. Select an activity and open the right panel (click on the paperclip icon or use the toolbar at the top of the screen). In the resources tab you will see the list of currently added resources. Click on a resource to open it and you will be able to select any of the RASCI roles as well as to make the resource invisible on the activity (if you prefer to only display the responsible resources in a process). In a process map you can run a RASCI matrix report against the current diagram and its lower levels. This would bring back a filterable spreadsheet with diagram names, activities performed, and all resources for which a RASCI tag was turned on. Too many Responsible or Accountable resources for any activity might lead to role overlap and conflict of jurisdiction. Too many Informed or Consulted resources may slow the process down and make it difficult to produce value on time. Too many Responsibilities may suggest resource overload; too few may mean that a resource is underutilized or not needed. Applying the RASCI model in Elements may be an extremely useful process & project management tool as long as you engage all internal stakeholders and make sure they all agree with the responsibility matrix. After the first attempt it is likely that some disagreements will occur - and that is good. The whole point of using RASCI is to make sure everyone understands and agrees on what their role in in any given activity. Using Elements for doing your RASCI analysis will save you time as you don't have to interview people or write down activities in isolation in an excel sheet. 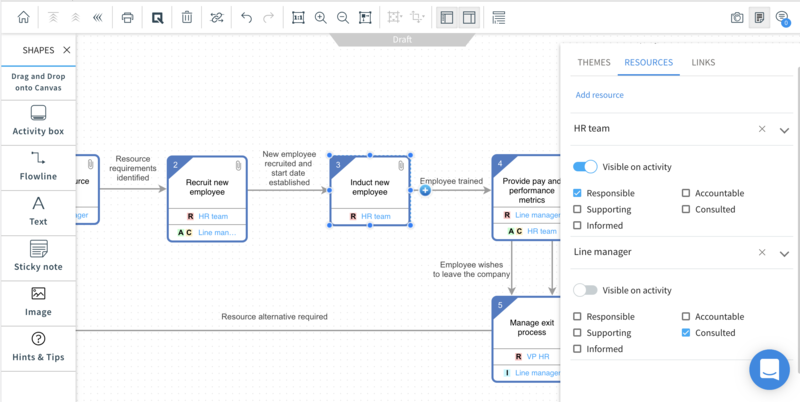 All roles are defined in the context of the actual process map and you can encourage collaboration and feedback via comments or diagram sharing.